This electronic voltage regulator is designed to work with a converted 2 brush 32E generator with maximum current output of 10 Amps. 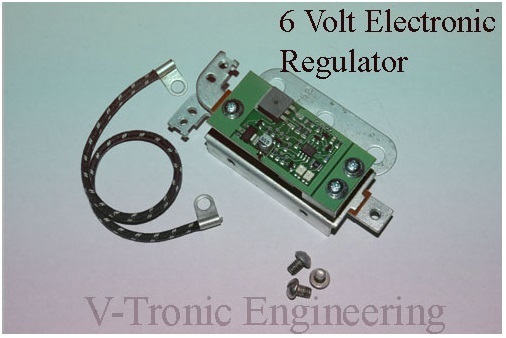 The voltage regulator fits best on motor cycles where the cut-out relay type 74750-38 (old nr. 4785-38) was used. The 45″and UL sidevalves and knuckles used this type, but also some other models used this cut-out relay. Please read various service manuals on how to convert standard 6 Volt three brush into a 2 brush generator. Identical look as the original 6 Volt cut-out relay when cover is installed; no one will notice the conversion to 6 Volt electronic regulator. This regulator works with all 6 Volt generators with field regulation to ground and have a max of 10 Amps. All products on this web page are distributed by Samwel supplies and can be ordered from your local dealer.